Looking for a solid, luxurious custom made bed that's just the right fit for you? Look no further. The Amish Urban City Chic Sleigh Bed combines contemporary and traditional styles for a delightful dreamland. The footboard is one smooth and cool clean line while the headboard takes on the gentle curves sleigh beds are known for. What makes this bed the best choice? It's Amish made, ensuring durability, strength and beauty for generations to come. It's customizable, so you can have this bed built with the quality materials and look you want. It's American made, which is a feel good choice to add to your home furniture collection. The Amish Urban City Chic Sleigh Bed offers the style and comfort you've been looking for. On top of that comes the excellence of Amish made furniture that out performs the rest. 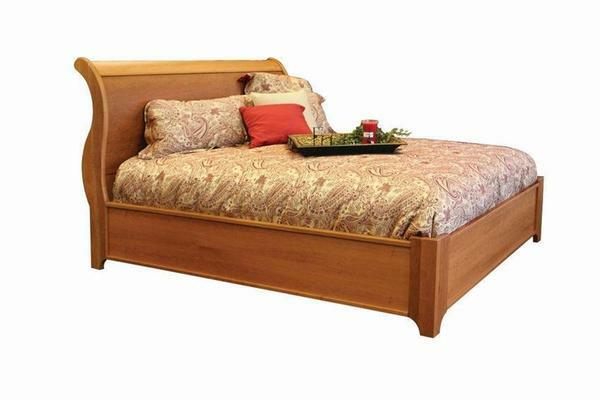 This custom bed is carefully handcrafted from premium quality hardwood and will not have to be replaced. If we can answer any questions for you, please don't hesitate to contact us via email or telephone. Thank you for shopping with DutchCrafters.